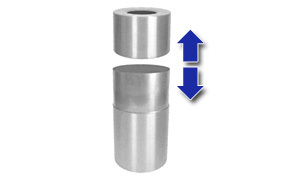 The two piece design creates an overlap area and eliminates the visibility of plastic liners. 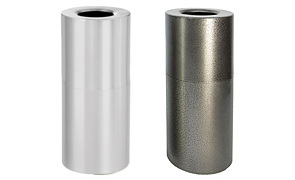 These trash cans are constructed with heavy-gauge aluminum with either a Powder-Coated Silver Vein or Satin Clear Coat finish, available in both 24 Gallon and 35 Gallon capacities. Silver Vein Powder-Coat Finish is highly scratch resistant. Rigid Plastic Liner is included.